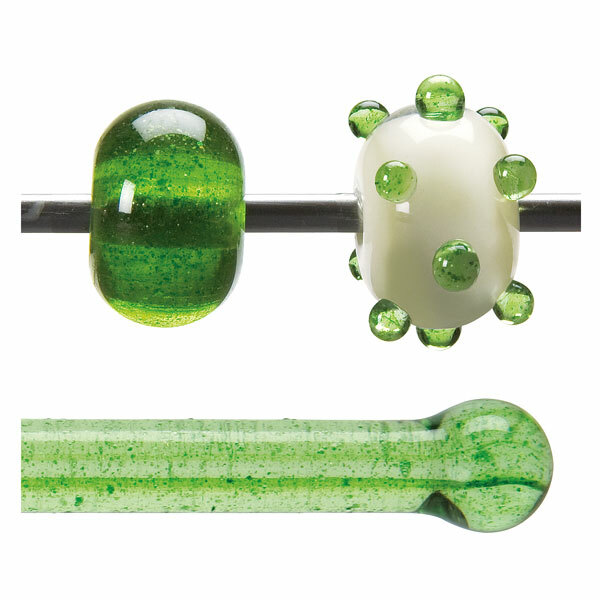 In cold rod form, the color of 001812-0576 can vary even within the same production run, but is generally a light transparent streaky green, with a gritty, sparkled texture. 001812-0576 is more transparent than Aventurine Green Transparent (001112-0576) and Light Aventurine Green Transparent (001412-0576). Torch: In the flame, the gritty texture of the cold rod translates to light sparkles suspended in a smooth transparent green glass. The streaks from the cold rod may be evident in finished work. A stable tint that is not prone to reduction in a neutral flame. Kiln: Various amounts of Aventurine Green streaked through a clear base. Expect variation. Aventurine streaks may be present at any location throughout the rod and are oftentimes part of the core.